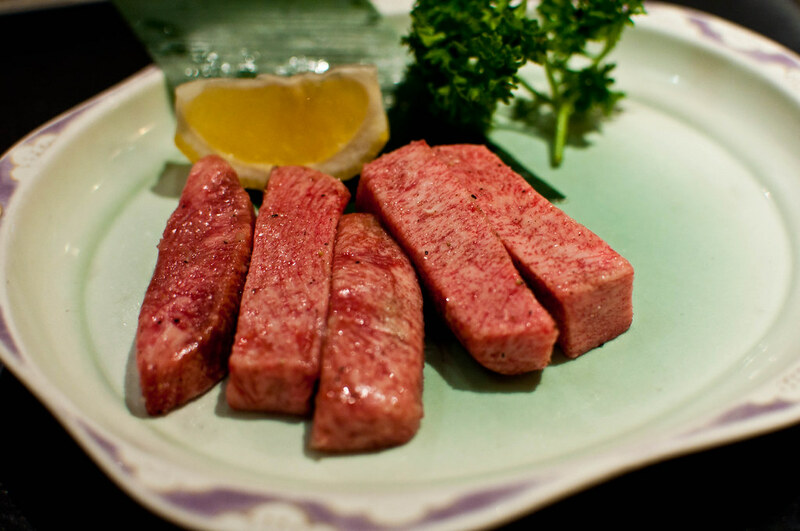 I haven’t been to Totoraku, the “secret beef place,” in just about two years. There are two main reasons for this: one, it’s very expensive ($200+) and two, I’m not actually able to make reservations. You see, only those that make some sort of impression and develop a relationship with chef/owner Kaz Oyama are able to get a table. Luckily, a friend of mine has the ability and invited me to go. While somewhat exclusive, Totoraku’s menu is rather simple. 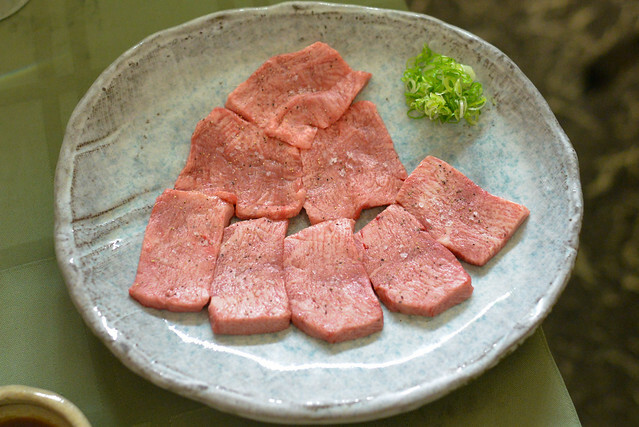 It changes pretty infrequently, relying on a few staple raw beef courses and various cuts of beef that you grill yourself. 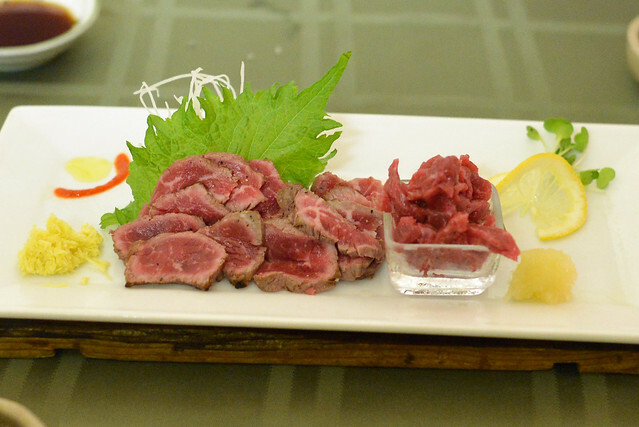 The key to the meal is the quality of the beef, which is almost Japanese wagyu-like in marbling. 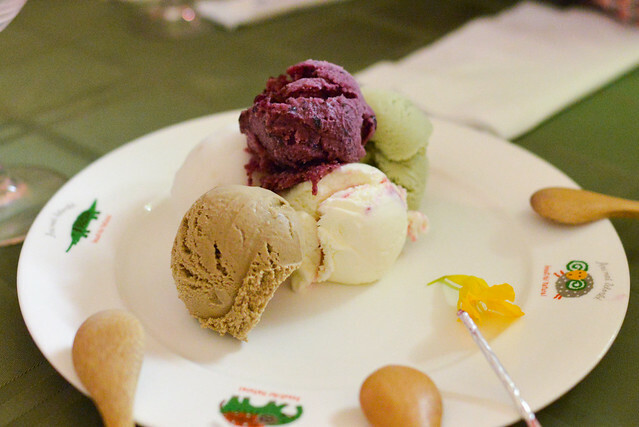 It comes from a secret ranch that the chef won’t disclose, but it’s surprisingly domestic. Aside from the beef, the chef is a known oenophile and bringing pricey Bordeaux to complement the beef and share with the chef has been an oft-used way to get a ticket for future entry. 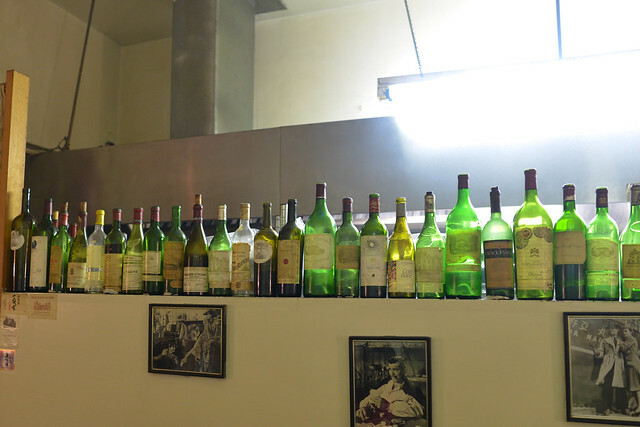 The wall separating the kitchen and dining room shows off some of his consumed bottles with names like Mouton Rothschild, Margaux, Haut Brion, La Tache and domestically, Harlan Estate and Opus One. 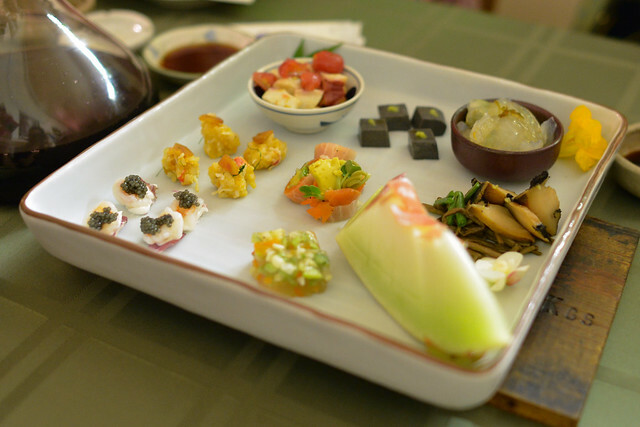 Shrimp with caviar, king crab sea urchin risotto, steamed bell pepper, homemade black sesame tofu, green tea noodles, honeydew with Prosciutto di Parma, and jellyfish with cucumber were the descriptions I caught. 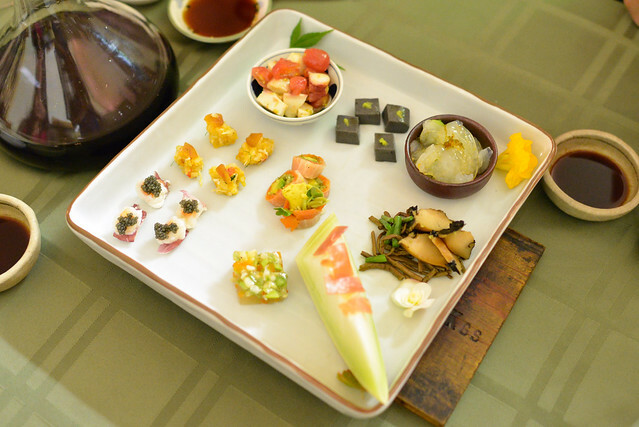 This is always an interesting plate with a myriad of flavors, all pretty good. 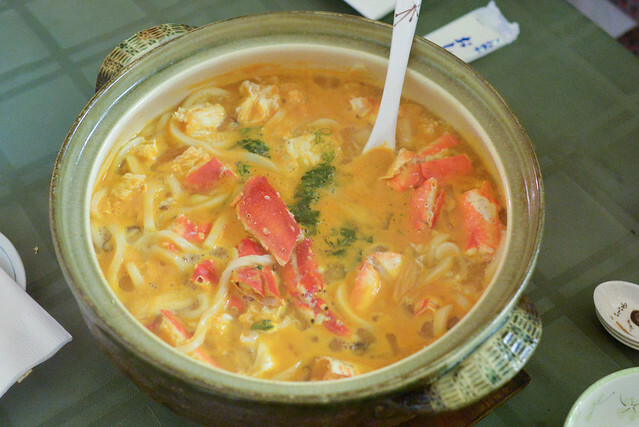 My favorite was the small bite of risotto bathed in an uni sauce, and topped with a small chunk of king crab. 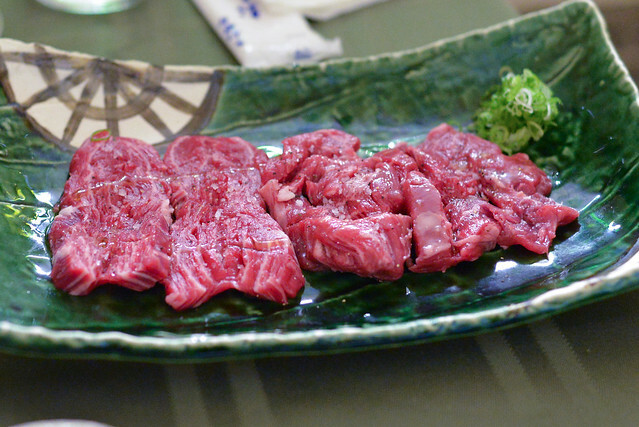 This was slightly chewy, but the beef flavor was very apparent complemented by bright, fresh onions. 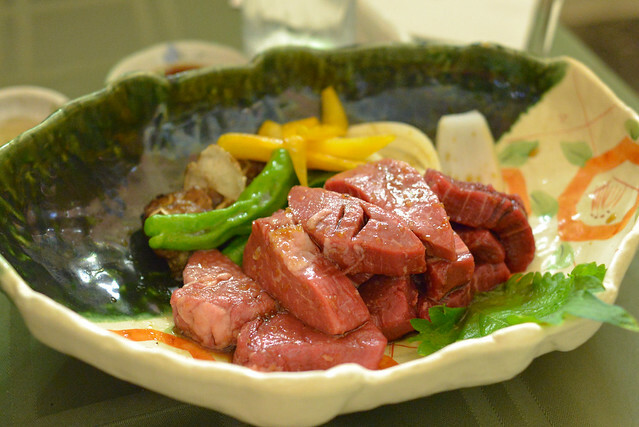 This is one of my favorite dishes here and Tototaku is still the only place I’ve (knowingly) had a cow’s throat. 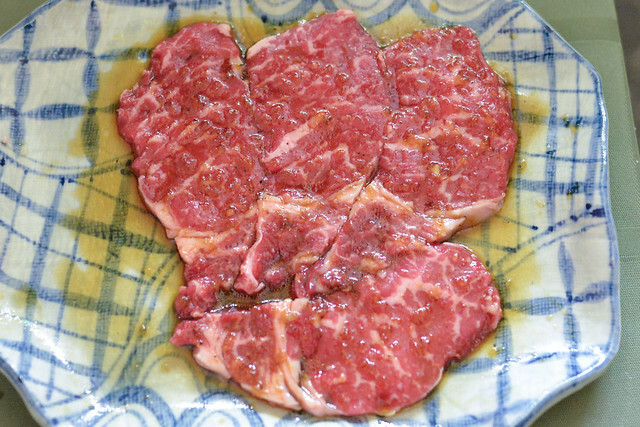 Rich and well-marbled, it displayed great flavor and a slightly chewy consistency. 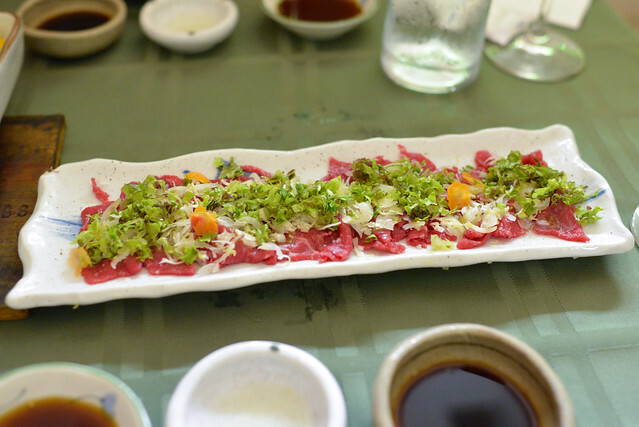 The seared ribeye tataki was expectantly good, though felt relatively pedestrian next to the throat. 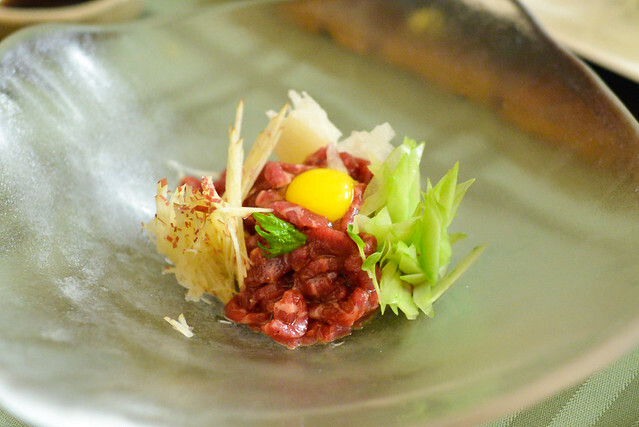 Our last uncooked preparation was this steak tartare. A deep, sweet soy flavor and rich yolk brought everything together in this dish, while the cucumbers and pears provided a bit of crunch and sweetness. 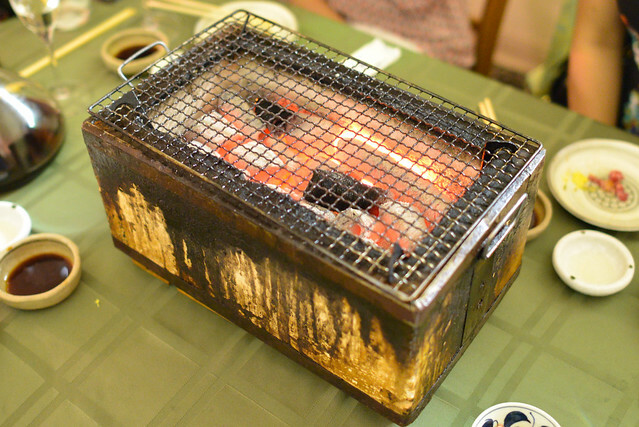 Upon completion of this course, the traditional Japanese grills came out, fueled by white binchotan. 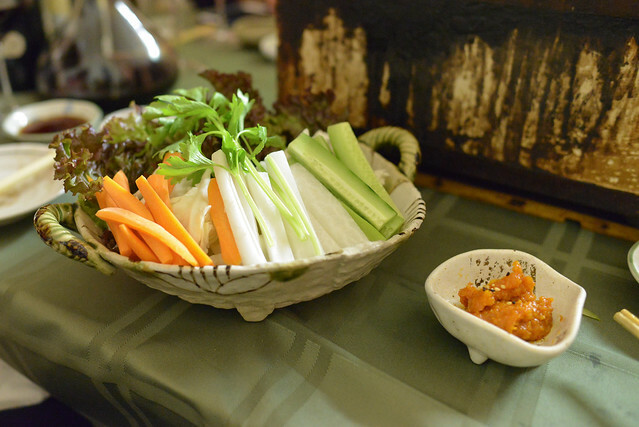 Crisp celery, carrots and daikon were also brought out to counter the rich meats. 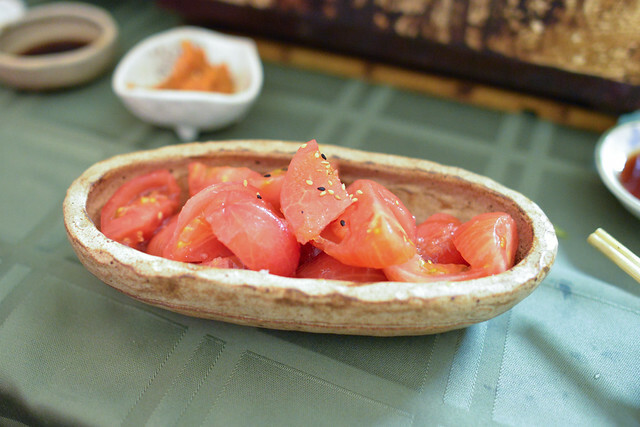 Extremely sweet momotaro tomatoes too! 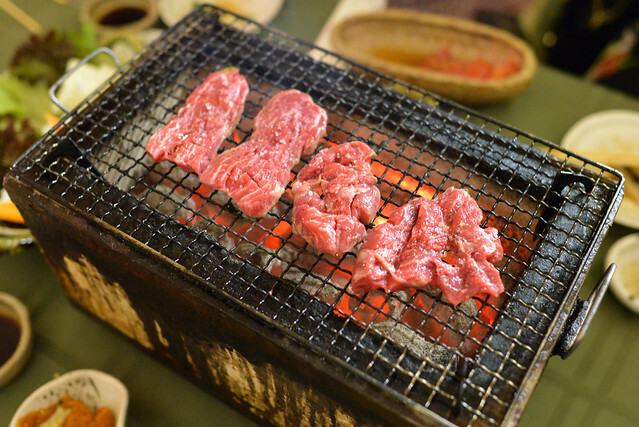 Each cut of beef was delicious, simple as that. 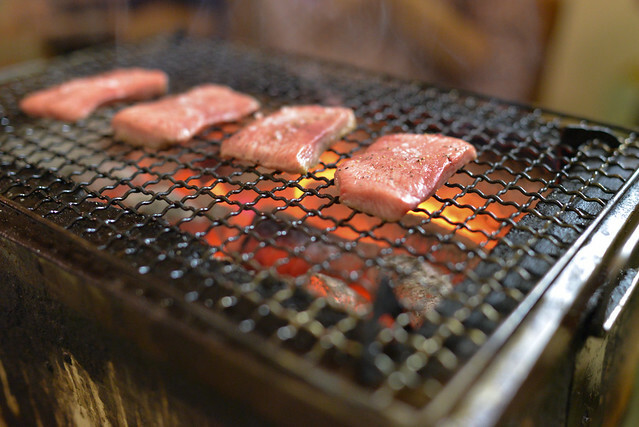 In the last two years, I had kind of forgotten just how good the meat was here. The tenderloin was probably the most surprising cut, being so juicy and flavorful I had to check twice whether it was actually the tenderloin. 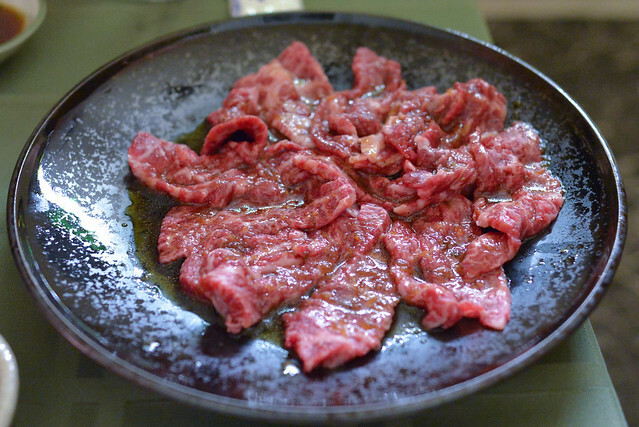 In terms of favorite, I can’t decide between the addicting chew of the beef tongue or the rich, fatty outside ribeye (one of the first restaurants in LA to serve the ribeye cap as a unique cut), or the beefy skirt steak. 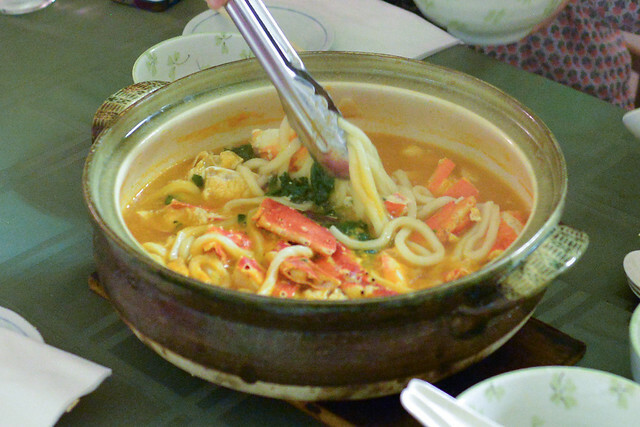 The king crab udon was as good as it looked featuring a mildly spicy broth, chewy noodles, and plenty of delicious, sweet crab. 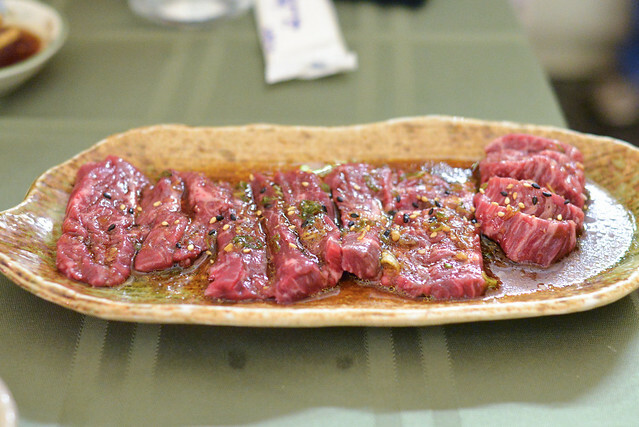 Even with the lifting of the Japanese beef ban, I think a meal at Totoraku still offers the best variety of high quality beef anywhere in LA. Did the chef give you his card?! Nope…but wasn’t trying to get one. Damn, yeah looks pretty close! 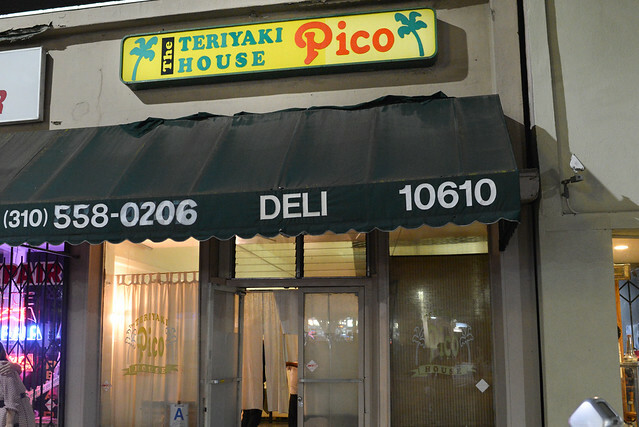 If you can get me, my brother, and uncle in to Totoraku we will pay for you and your friends meal (whoever has the card) message me if interested in helping some good samaritans eat a once in a lifetime meal….